The TOEFL (iBT) was launched in 2005. It is intended to replace the other two versions of the test and is gradually becoming available worldwide. The new TOEFL iBT is a linear and not a computer adaptive test. This means that every candidate answers questions from the same range of difficulty, rather than receiving questions based on their ability levels. 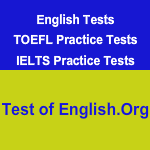 The TOEFL iBT consists of four sections: Reading, Listening, Speaking, and Writing. All four sections are taken on the same day, and the entire test is about four hours long. What is most unique about the test is that it asks you to combine, or integrate, more than one language skill, just like you do every day. For example, sometimes you read a passage, listen to a short lecture about a topic, and then speak or write a response. And you can take notes throughout the entire test just like you would in a real academic class. Language heard on the TOEFL iBT is designed to sound like real-life conversations. The reading passages are taken from real textbooks and course materials. Go online to register for a test. You can also register by phone or mail. When you register for the test, you can designate which universities you want to receive your scores. Or, you can wait until you receive your scores before sending them to your selected universities. Your scores will be available online 15 business days after you take the test. ETS will also send you a paper score report for your records. TOEFL is a source of anxiety for most international students who are not educated in English. But remember that it is almost unavoidable. Required TOEFL scores vary by institution, usually, the more prestigious the university, the higher the TOEFL score. So contact your selected university or college to determine their score requirements. On the TOEFL Web site at www.ets.org/toefl/ibt/codelists.html you’ll find a list of 6,000 institutions that accept TOEFL scores. You can also view a list of score requirements for some representative universities.